Take a moment to think about how you think about how you eat. How do you decide what you want? How do you decide what you need? What do you say to yourself when you eat a cookie? What do you say to yourself when you eat a salad, pizza, french fries, processed foods, organic foods, gluten, dairy, fat, kale? What beliefs do you carry with you about right and wrong when it comes to food? Where did you learn that? Almost no one is free of beliefs, rules and attitudes about food. But some of us have experienced an undue amount of emotional pain as a result, riding this rollercoaster of harshly conditional self-love. And some people develop full-blown eating disorders where rules, punishment, and rebellion formulate some of the most wretched, soul-destroying patterns to break free from. Today, I’ll focus on the gray zone: disordered eating. Disordered eating for me felt similar to an eating disorder, just with slightly more flexibility. Slightly. Instead of destroying my soul, it always had a knife to its neck. Beginning in early childhood, over the course of my life, I acquired a relentless encyclopedia of nutritional dogmas, many of them contradicting one another, which became a central point of concern (*ahem*…obsession). I’d fixate on how “good” or “bad” I was being and how “good” or “bad” others were too. I’d constantly fret over my weight and attractiveness or what kinds of horrible poisons I was putting in my body. My weight fluctuated quite a bit as the hyper-militant and the rebellious parts of my psyche were at war with each other. Just putting this experience into words, I’m reminded of how difficult it was to breathe back then. And here’s what’s so dangerous in the gray zone of disordered eating: mainstream U.S. culture supports it. Of course, if someone knew you were throwing up after meals, having late night binges, or only eating 200 calories a day, they would be concerned. But almost everyone is bouncing around like lost particles in the mass confusion that is diet, weight, and exercise. 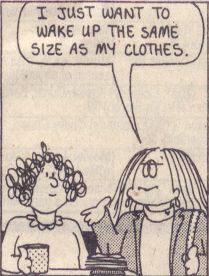 It can be really hard to know how much pain you’re in when it’s normalized (like those super annoying “Cathy” comics where she’s always worrying about her body). Likely, a co-worker will make a comment about how “good” you are if you bring a salad for lunch. Likely, your friend will tell you how great you look if you lose a few pounds. Likely, no one will ask you if you feel OK when the outside result shows something we’re all programmed to desire for ourselves. With some mainstream attention being brought to the ills of fat shaming, people are thinly veiling their remarks with concerns about “health” despite the growing evidence that weight is not a predictor of health. Because the culture supports this hyper self-improvement, 4-Hour Body mentality, we can get stuck in magical thinking, believing the problem is the body which should/can be controlled instead of thinking about the role of the mind. 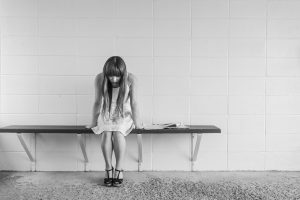 The underlying issues that lead to disordered eating are often quite similar to the underlying issues in eating disorders. First and foremost, it’s not about food. It’s not really about thinness/fatness, though your anxiety may manifest in this way. When I reflect on my own patterns, I see that this obsession with my body was about feeling unlovable. It was about feeling afraid of taking up space – literally and figuratively. It was also about feeling like my world was chaos and I had to hold it together. And when I couldn’t hold it together perfectly, it was about collapsing into the chaos (not leaning in, but collapsing). I used to feel crazy, but now I know these thoughts and feelings aren’t uncommon. Nothing is more basic than our need to be fed as infants – both physically and emotionally – and our need over time to learn how to feed ourselves. And it’s really easy for this process to be derailed by relational trauma, physical trauma, deprivation (real or perceived), shame, and over control from external sources. We lose touch with what our bodies feel. We learn to push through the pain or avoid pain entirely. Some of us ignore cues that we’re hungry while some of us eat nonstop out of fear of feeling our hunger at all. Similarly, we learn to push aside our feelings of longing, anger, joy and loss – perhaps isolating to avoid relational pain entirely. We might ignore cues that we need others emotionally or binge out on relationships for fear of feeling our inner emotional deficits at all. Finding peace with food means finding peace with our hunger and the ebb and flow of our complex bodies. But beyond the body, in finding peace with food, I’ve had to work hard to build my tolerance for the unknown/uncontrollable and vulnerability in relationship to others. This is exactly what eating disorder recovery is all about. But wherever you lie on the disordered eating spectrum, maybe you’re in pain for the same reason. You frequently think your life would be better if you were thinner. Dietary “missteps” bring you lots of anxiety. You frequently weigh yourself and use that number to determine how you should feel about yourself as a person. You feel urges to punish yourself or overcompensate when you’re “bad”. You can’t tell if you’re hungry or full. You find yourself eating mindlessly on a frequent basis in order to cope with difficult feelings. You find yourself restricting your food intake on a frequent basis in order to cope with difficult feelings. You equate “health” with thinness. You can’t stop checking your body in mirrors and shop windows. You can never enjoy a single photo you’re in (even if it’s a beautiful photo from a beautiful memory) because you hate the way you look. You’re frequently comparing your body or diet to others. Ok, so you need help. Now what? There are a few different yet interconnected parts that need attention so here I’ll break down how different types of professionals or other resources can support you. This is where you can work on that deep down stuff – the underlying feelings of unworthiness, isolation, anxiety, deprivation. In building a relationship with your therapist, you can begin to heal the wounds that keep you locked in patterns with your body and food that are no longer serving you. You can learn to take in another’s love and learn to nourish yourself emotionally as well. You can build your tolerance for those seemingly intolerable feelings. In conjunction with relational work, a therapist may help you directly address thoughts patterns and behaviors through co-created “homework” or experiments. In my work with eating disorders, it’s really important for my clients to also work with a Registered Dietician who specializes in eating disorders and can help them manage their meals and behaviors around food. This person will also provide lots of vital education and break down the science of how food really works, dispelling fact from fiction so you can feel more ease and enjoyment from food. One difference I’ve found in the disordered eating gray zone is that disordered eaters may have enough access to their body’s internal cues to learn Intuitive Eating or some other similar approach that shuns prescriptive diets and focuses on listening to the body. People with extreme eating disorders often need to eat according to a meal plan for a while so their body and mind can get more on track before delving into trying to understand the long buried and hijacked hunger and fullness cues. An RD or Intuitive Eating Coach can help you determine what level of structure you need at first. In addition, you may also want support from your doctor and a psychiatrist. Pay attention to the messages you’re getting from your current care providers. Are you being supported in the way you need? If you haven’t heard my podcast, A Therapist Walks Into a Bar, subscribe in iTunes or join the mailing list so you don’t miss June’s episode which is all about disordered eating and eating disorders. This episode will feature eating disorder expert and Erasing ED filmmaker, Nicole Laby, and Webby Award-winning writer/actor/director of the Refinery29 comedy web series “The Skinny”, Jessie Kahnweiler. Share the post "How do you know you need help? Living Through the Gray Zone of Disordered Eating"